A form displays controls that allow a user to perform an action, such as enter data, display a report or folder, or manage entities. You can create a flow that, when run, opens a form. It is possible to attach a Mobile	and a Tablet	version to the original version of the form. These forms will run in case that the user is trying to run the flow from a mobile device. They could be set in the Flow Designer&apos;s Tool Box under Form Setup Options	. Name The Flow and click CREATE	to proceed. Next, we select Basic Form in the Flow Designer&apos;s start-up window from Flows, Rules, Forms and Reports >	Forms[Interaction] > [Current Folder]	category, click Add	to add it to the flow. Next, connect it to the end step. From the resulting pop-up window we select our Mobile Form	and click Pick	to save. 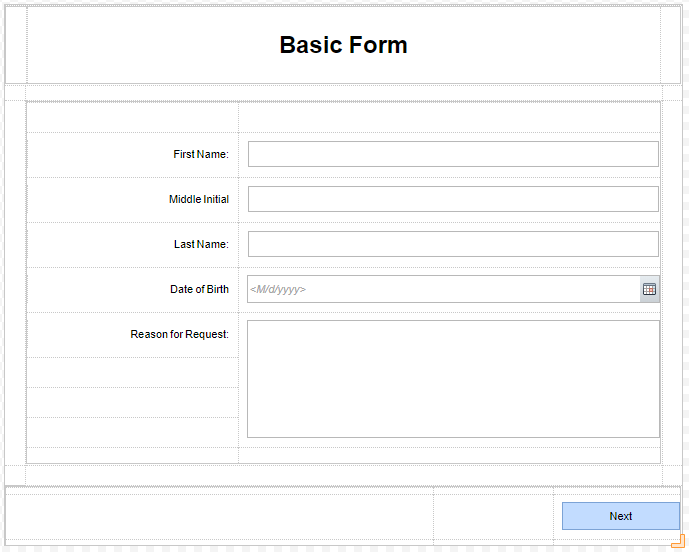 Next, do the same for Tablet	form... Click on the Tablet Form	picker and pick our Tablet Form	. This completes our Flow. Save and close it.